A few months ago some arctic researchers were predicting the possibility that the North pole could be ice free this summer. So what happened? First of all the North Pole did not melt. Predictably this fact was gleefully reported by deniers, who failed to mention that the arctic researchers gave 50-50 odds for an ice free north pole. Some deniers also made the (obviously wrong) assumption that an ice-free north pole equals and ice-free arctic. So given that the north pole is still covered with ice were the deniers right? Were the arctic researchers spouting alarmist nonsense? As I (and the researchers) stated when the predictions of an ice free north pole were made, whether or not the North pole became ice free this year would be largely meaningless, but rather it should be seen as a continuation of the rapid melting of the arctic sea ice. The 2008 melt season resulted in the second lowest annual seas ice minimum ever recorded. It was second only to last years record breaking melt. We’re kind of in a new state of the Arctic basically, and it’s not a good one. 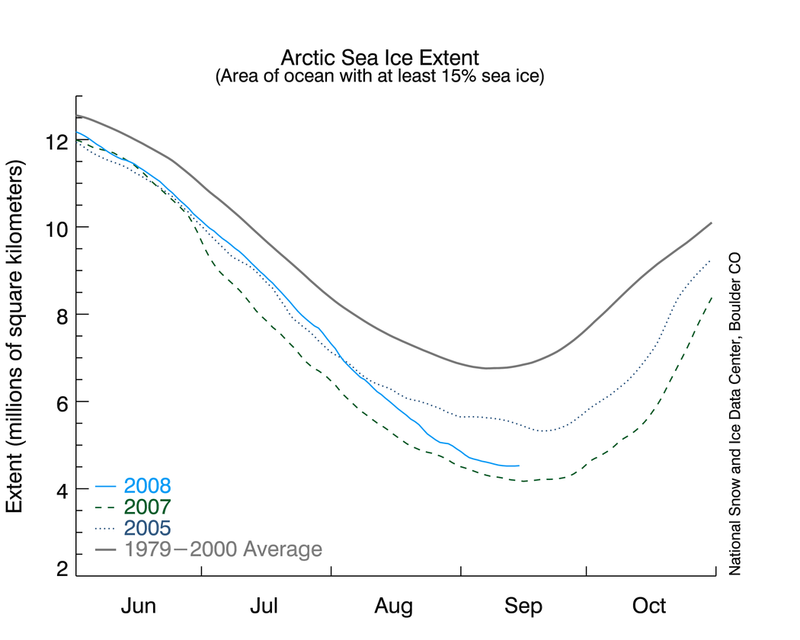 We’re definitely sliding towards a point where the summer sea ice will be gone. And that is not a good trend. Just remember this next time a denier trumpets the fact that the north pole didn’t melt this year. Sea ice at the north pole recovered a whopping 9.4% from 2007 to 2008 despite the doom and gloom predictions of the alarmists. Yet another wheel falls off the global warming bandwagon. 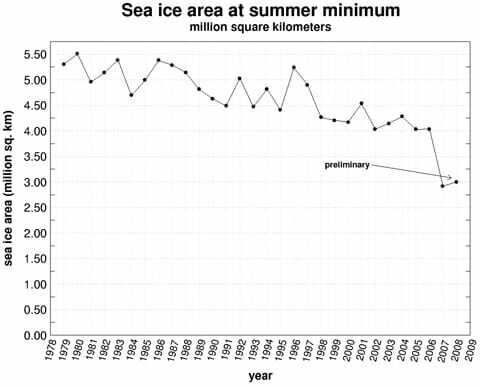 It is true that the minimum summer ice extent in the arctic ocean in 2008 was 9.4% higher than the minimun in 2007. But calling this a recovery is simply not justifiable, not even by a long shot. Firstly, at 4.52 million square kilometers, this measurement is 2.24 million square kilometers below the average minimum observed since 1979 when accurate satellite observations began, so we are nowhere near getting back to normal levels of ice cover. (Source: NSIDC) Secondly, year to year flucuations are very large and simply reflect the chaotic nature of weather, the change over a single year does not say anything meaningful about climate trends. There are several things worth noting that we can see from this image. Not only is 2008 below the average as noted above, it fell well below the downward trend line, the fourth year in a row to do so. 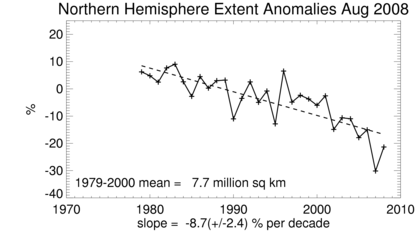 So hardly showing sings of recovery, this year is consistent with an accelerating ice loss. We can also see that an almost 10% jump from one year to the next is not unprecedented. The jump up from 1995 to 1996 was even larger, nearly twice so. The differences between 1989-1990, 1994-1995, 2001-2002, and 2006-2007 all were larger as well than the difference between 2007 and 2008. We can also see that 2007 was really an exceptional record setter and aside from that year, 2008 is lower than any other. This is hardly the “warming is over” news the climate denialist organisations and websites have been proclaiming or at least implying. This is nowhere near a prediction of total summer ice loss by 2008 and it is looking more and more like it will be very wrong by being too conservative. This is not the hallmark of an “alarmist”! So, I guess the reality is that 2008’s summer arctic ice extent observation is not a wheel off the GW bandwagon, it is one more nail in the coffin of denialism. 50/50 is even odds, you could give even odds to anything and be right half the time. The fact they gave even odds and the Arctic wasn’t even close to being ice free shows how little real science has to do with your global warming alarmists like you Stupid Dan. you could give even odds to anything and be right half the time. Poor, blanks, you simply don’t understand how probability works. You would only be right half the time IF the odds of the thing you are predicting are 50-50. …the Arctic wasn’t even close to being ice free. No one was predicting an ice free arctic, the fact that you say otherwise indicates that you are either ignorant or dishonest, and given your laughable assertion that the fact that the 50-50 prediction that never materialized as ‘proof’ that the science is bunk makes me think that you are completely ignorant… but at least you cover it up with petty name calling to make you seem smart. Good for you. Scruffy Dan seriously, are you a ‘challenged person’ I mean either on prescription medication for certain “challenges” some in society live with or considered “challenged”, you went to school on the other ‘special’ school bus? You really shouldn’t be bringing “science” into global warming or the sudden acceleration of Artic sea ice melt as a way of evidence. These things are historical and “cyclical and predictable”. All you have to do is watch Suzuki’s latest tv documentary to know that “global warming is historical and is nothing new”. You sound more like a politician or employee of the government or like I said your “challenged” in some way and likely using medication that is clouding your basic judgment. Blanks if you want to insult someone’s intelligence, you should probably be certain that what you write is free of spelling/grammar errors, otherwise people might think it is you whose intelligence is ‘challenged’. Right, why rely on science on a scientific issue when obviously you know better. As for David’s Suzuki’s latest documentary, frankly I don’t care. I prefer to get my science from actual scientists who publish in the primary literature. Plus I thought you types didn’t trust Suzuki, so why bring him up? Blanks I have been very lenient with you as your comments have been obvious violation of the comment policy, I suggest you read it if you wish to continue posting here. I won’t tolerate any further violations of the policy. Frankly you don’t care but David Suzuki is the poster boy for global warming alarm-ism and his own TV documentary says it’s “historical” and “cyclical and predictable” and “not new”. I don’t think Suzuki can watch his own shows if he is still promoting man caused climate change. It just isn’t there in the history of climate change. Water vapour is actually the worst green house gas in the environment and not C02! C02 doesn’t even come close to the affects of H20 and that is science fact not the science fiction we hear about from the “Green” “experts”. First of all I don’t think Suzuki said what you think he said, but even if he did it doesn’t matter. David Suzuki is NOT a climate scientist, thus what he says isn’t part of the scientific debate. I prefer to get my science from actual climatologists. IF you really wanted to debate the science you wouldn’t continually bring up the (likely misrepresented) point of views of non-scientists. Secondly, don’t you see the inherent contradiction in what you are saying? You say that Suzuki is the poster boy for global warming alarmism, yet you say he denies AGW. Which is it? It cannot be both. Water vapour is actually the worst green house gas in the environment and not C02! The influence of Water vapour is fully discussed in the IPCC and relevant literature, and is fully consistent with AGW. The fact that you bring it up as ‘proof’ that climate change is false highlights you ignorance of this issue. Most people would realize that lack of knowledge and understand that it makes them completely unsuitable to challenge the expert consensus, you on the other hand haven’t yet come to that realization. If you want to continue this debate please educate yourself on the basic science of climate change (my comment policy has several good links), debunking the same denier talking points every time I write a post on climate change is tiresome.